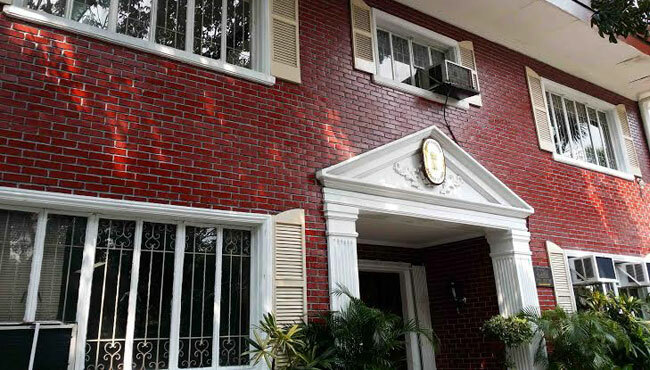 The Embassy of India is located at 2190 Paraiso Street, Dasmarinas Village, Makati City. The Embassy and the Ambassador's residence (located at North Forbes Park) are Government of India properties purchased in 1981 and 1979 respectively. The Dasmarinas Village like other Villages of its kind in the city of Metro Manila, has its own civic bodies including security, sanitation, health etc. The Embassy itself nestles in the sylvan surroundings of the Dasmarinas Village-quiet and peaceful. The Embassy area just as the entire Village is not a traffic thoroughfare. Trees and huge houses line up most of the Village. Several other foreign Embassies are also located in the Village.